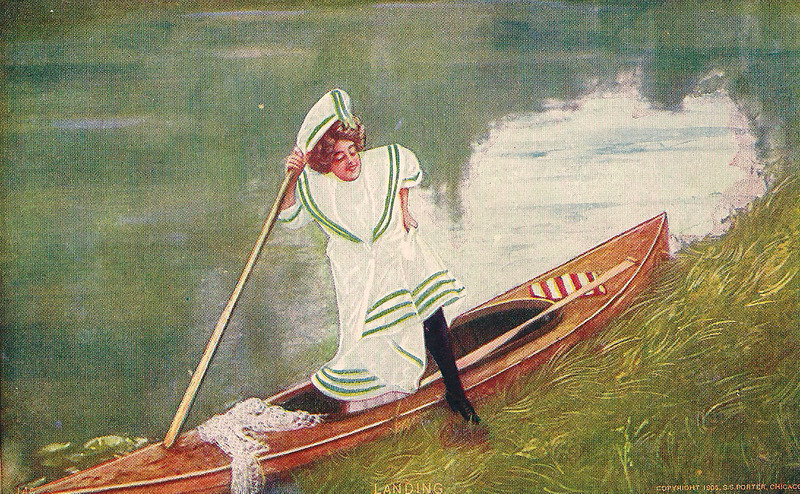 One of the things I’ve always found almost as interesting as boats is images of boats, especially pop culture and advertising images. Pop culture? Really? But it’s so, well, so popular. What does it really have to say? A lot, I think. The same argument is sometimes levelled at pleasure boating as not being a subject worthy of serious study because it “only” deals with pleasure (as if the pursuit of pleasure hasn’t been a constant of human affairs for some time now). The thing about pleasure boating, and its wealthy cousin yachting, is that they’re of significance precisely because they’re not serious (unless you’re trying to win the America‘s Cup, perhaps), and this is what makes them important. The purchase of a pleasure boat is the ultimate discretionary expenditure. There’s no practical reason to own it unless you want to, or you think it’s beautiful, or it makes you happy, or all three. If you think about it, then, these purchases can tell us about what we really want, unfettered by the practicalities that constrain our everyday acquisitions. 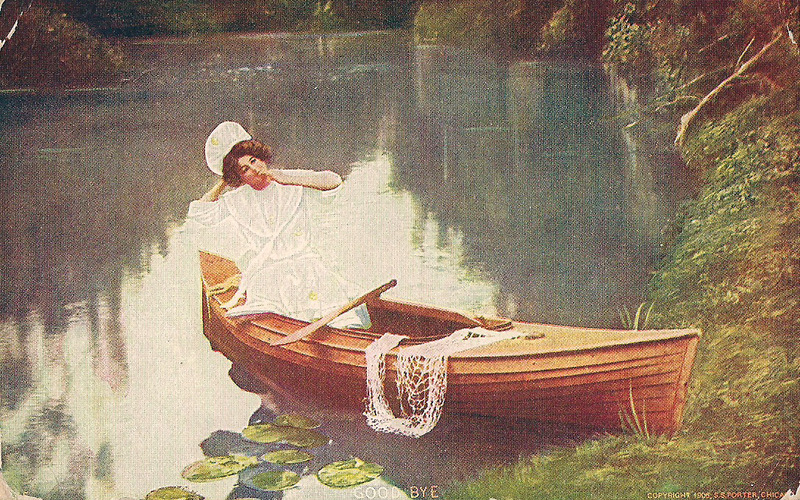 If pleasure boats are an interesting place to study people, therefore, then advertising for pleasure boats, or that uses pleasure boats, is a great place to find out what we all desire. I’ve been collecting images of pleasure boating for a while now, and for me it’s a real pleasure because I only acquire things that interest me. No scheme, no system, no need to have footnotes or be representative of a particular historical style or period. I just get things I like. I think I’ll share some of these with you from time to time, so here’s a few to start us off. These are all on the theme of canoes and double paddles. 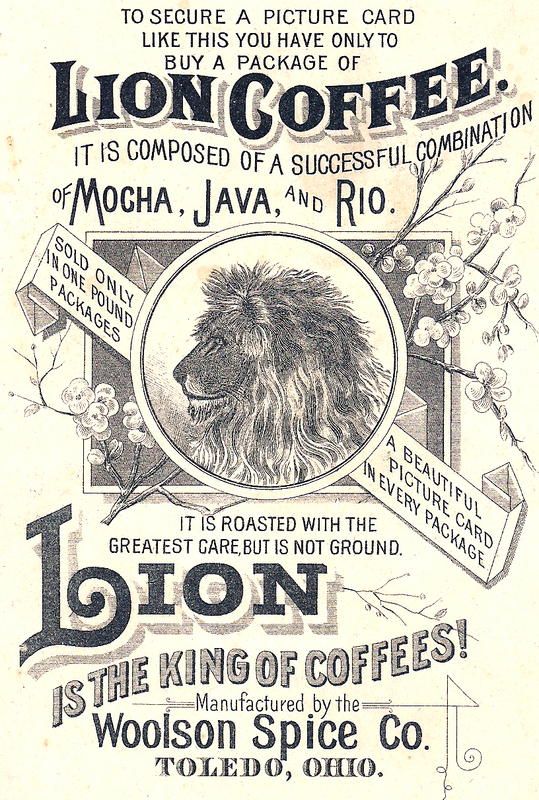 And the connection between Lion coffee and canoeing is, well, it is what ever you would like it to be. 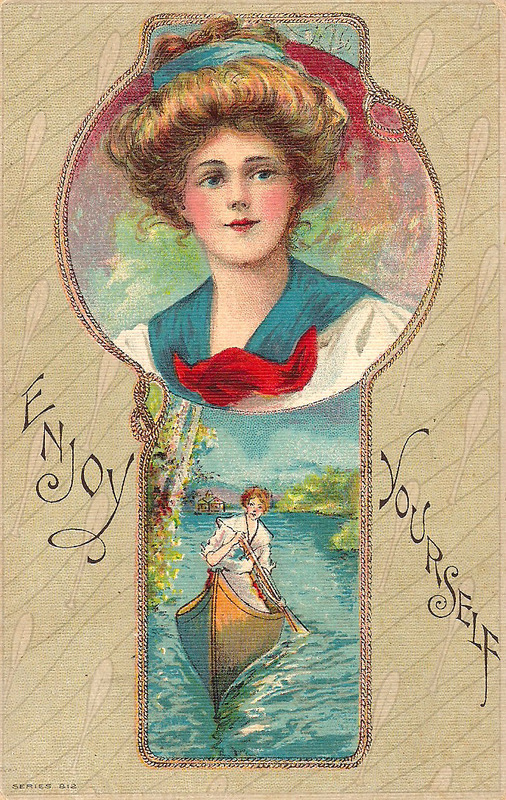 As it it says at the top, you had to buy the coffee to get this charming trade card. 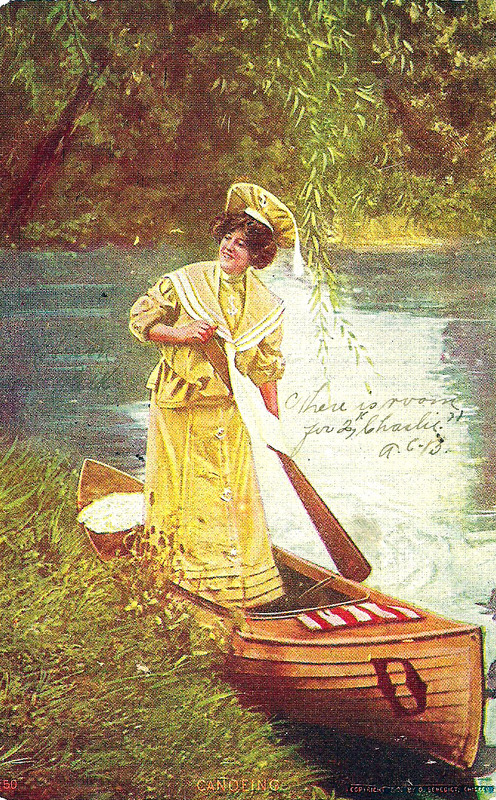 On a less muscular and manly note, we have some very slender 1880s young ladies paddling some very slender Rob Roy canoes. I’m not sure what the displacement of the hull in the background is, but I would think that it’s not suited to rough water use. 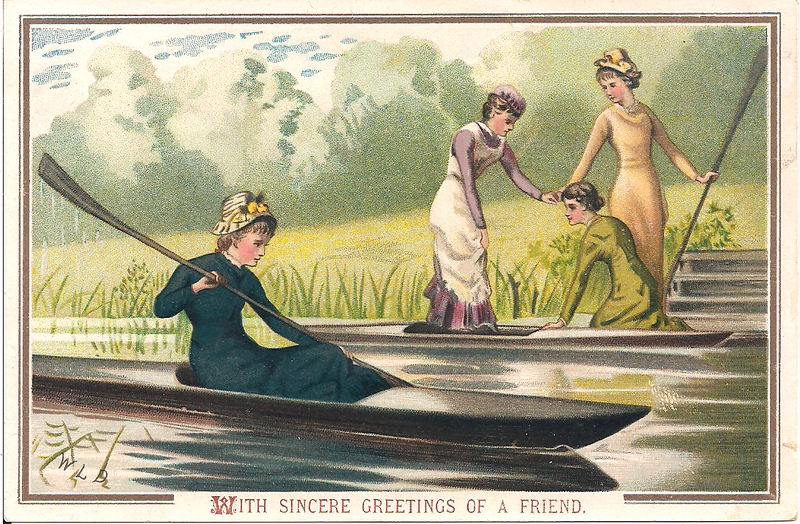 This is a lovely, serene pastoral image, perfect to accompany your note to a friend. 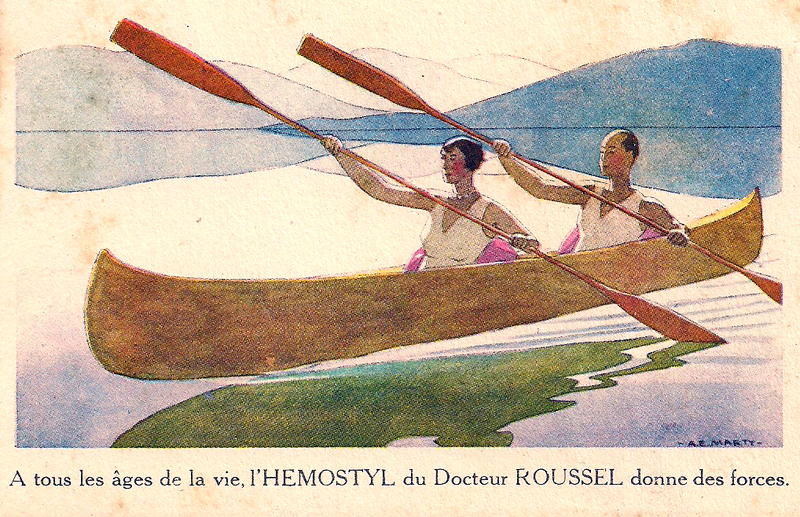 Skip ahead a few years to the 1920s, and this trim couple have been so rejuvenated by taking Dr. Roussel’s anti-anemia remedy that they are able to paddle in perfect synchronization–as the tag line says, it gives you strength. 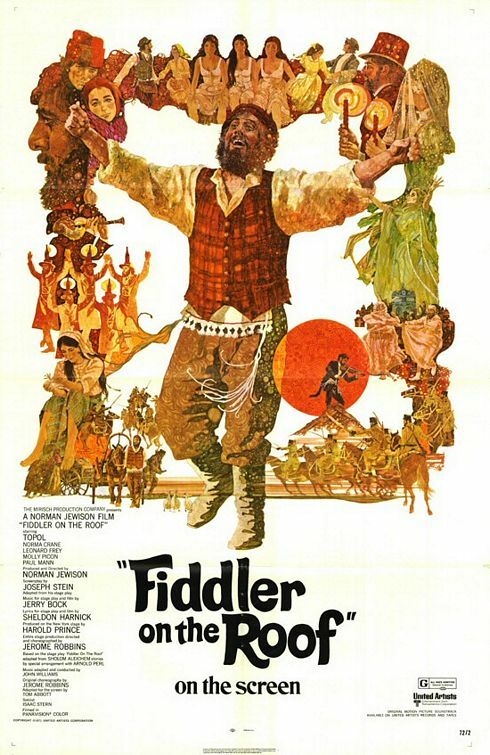 And here’s a personal favourite. Once again, nothing says Rob Roy canoe like a striped t-shirt. 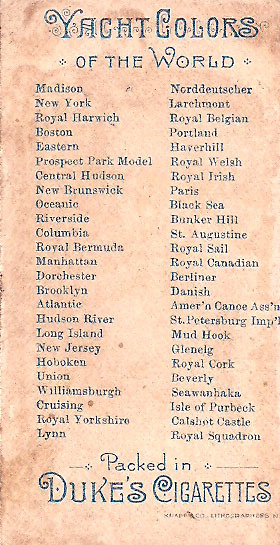 One of the earliest pieces in my little collection, this tiny tobacco card, measuring 3″ x 1 1/2″, is from 1888, one of a set that depicted a rather ecclectic group of watercraft ranging from iceboats to battleships. 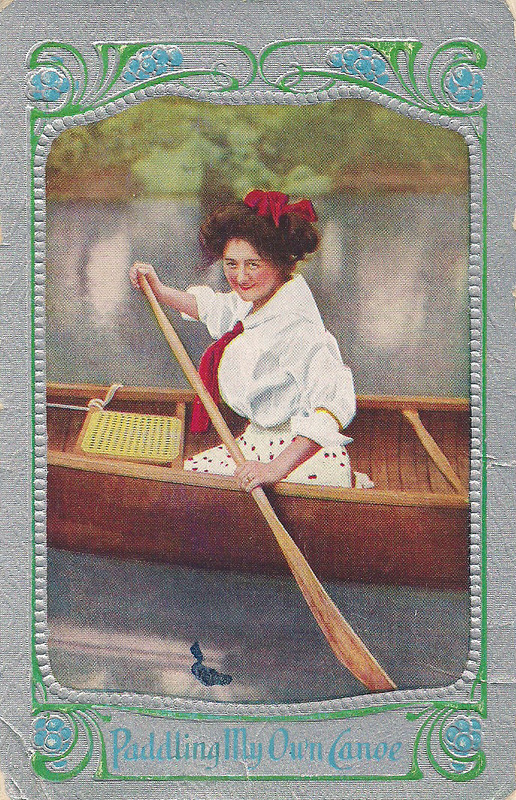 It is also one of the earlier instances I’ve seen of the slightly disturbing pairing of canoeing [think healthy, outdoors, clean] with tobacco and smoking [think the opposite]. This ran all the way through to Camel cigarette ads in the 1980s that showed our hero lighting up as he paddled. 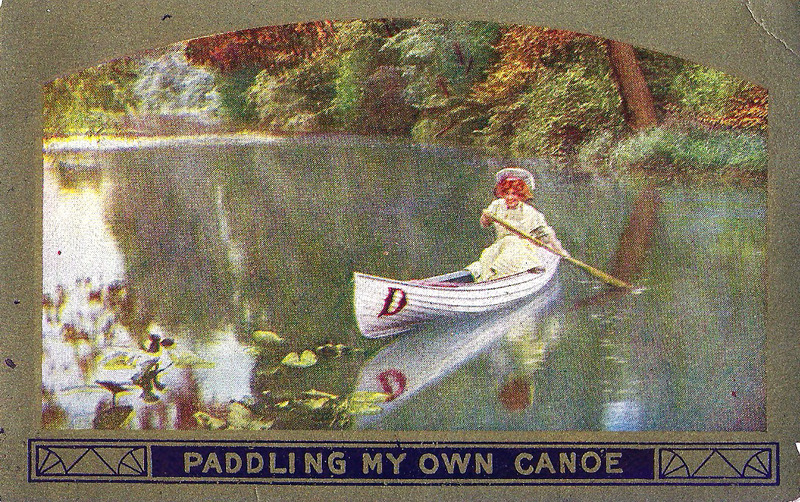 There’s so much to like about this image, including its well-proportioned canoe, the tam on the paddler’s head, the artful spray of water fro the upper paddle blade and the large, pointillist printing dots. Two nice boats in the background too, one with a dipping lug to the left and another canoe or two to the right. 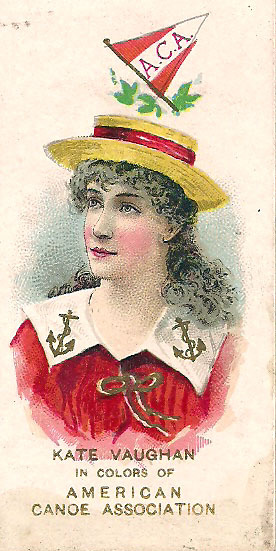 In the December, 1886, issue of Frank Leslie’s Popular Monthly magazine, the noted American journalist and yachtsman W.P. 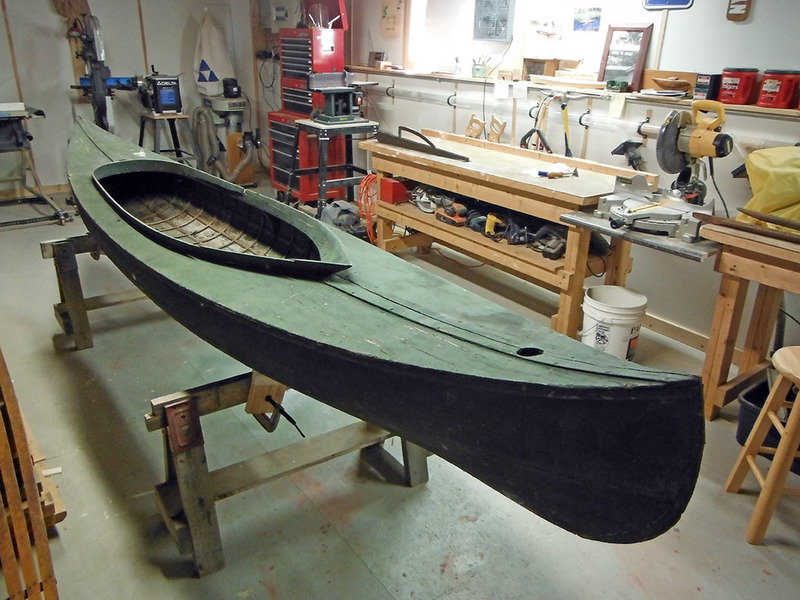 Stephens, about whom I’ve written before, published an article called “Why We Canoe.” You can read the text of the article online here, courtesy of Google and the Hathi Digital Library. 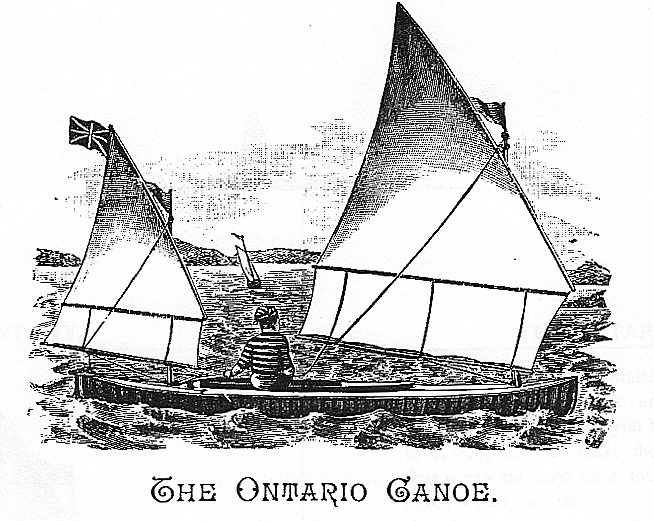 Stephens was a tireless promoter of the sport of canoeing, and especially canoeing under sail, and with his canoe Jersey Blue was a fixture in the early days of the American Canoe Association. 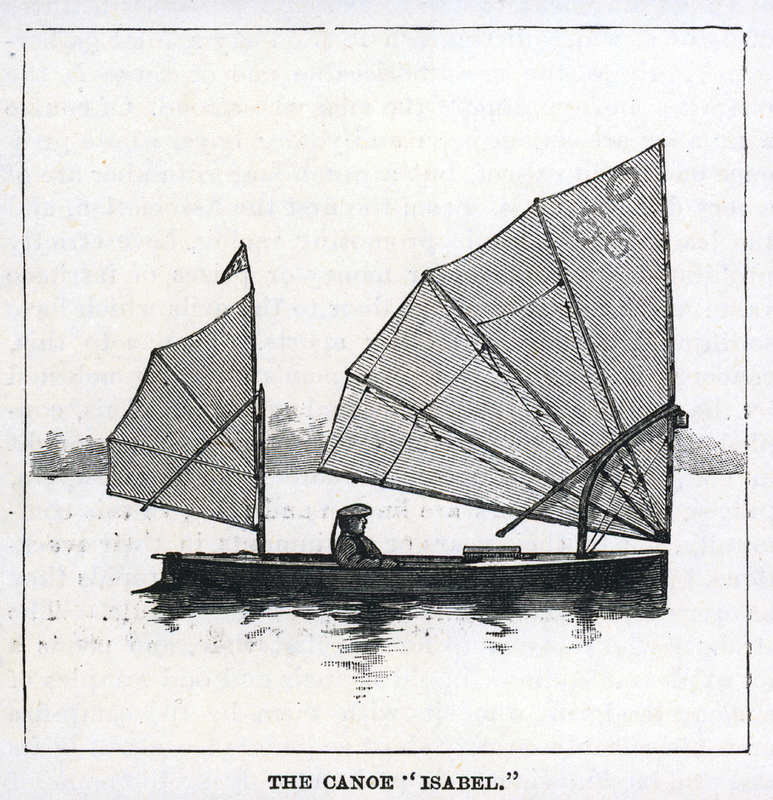 A copy of his wonderful Canoe and Boatbuilding: A Complete Manual for Amateurs should be on the shelf of anyone with even a passing interest in canoe sailing and late 19th century small craft. The book went through many editions, and original copies can be found for sale at a reasonable price. It’s also been reprinted. 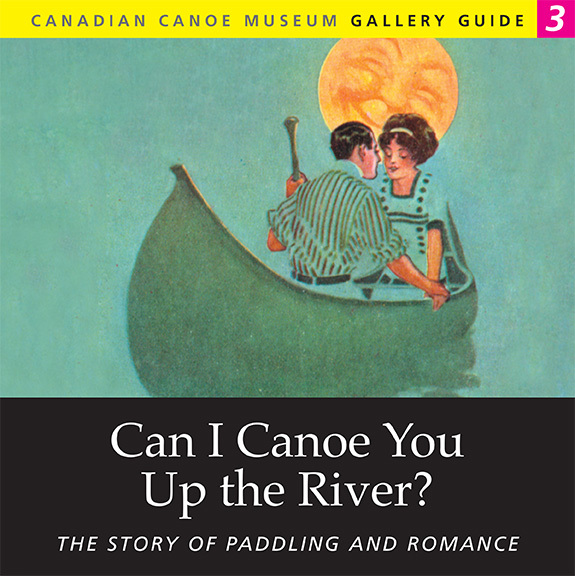 My friend Dan Miller over at Dragonfly Canoe Works has kindly made it possible to read the book online. As important as the book, but much harder to find, are the plates, which originally came out in a companion volume. In 1987, as the date on the cover of my well-thumbed copy says, Mystic Seaport Museum collated and re-published a complete set. Mystic also holds Stephens’s drawings and papers, a veritable treasure trove of canoeing and yachting history. 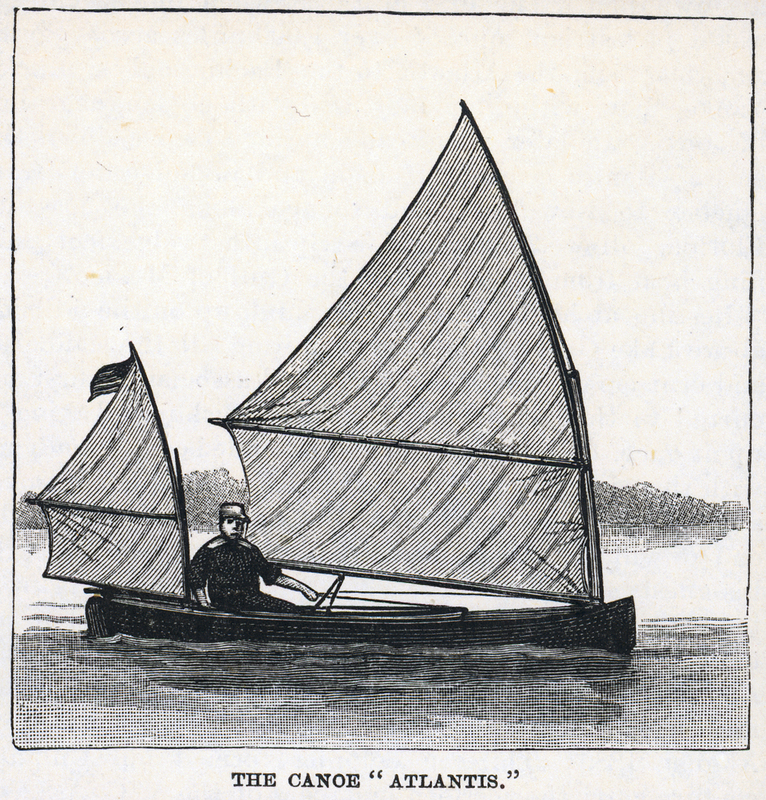 The article is vintage Stephens, arguing strongly in favour of his preferred type of sailing canoe, the all-’round paddling/sailing boat, suitable for extended cruising. He notes with approval the recent development of classification rules by the American Canoe Association, designed “to prevent, as far as possible, the construction of racing canoes.” Unfortunately for Stephens but fortunately for those of us who enjoy 16-30s, ICs and other “dangerous racing freaks,” as he condemned them, racing craft did develop. 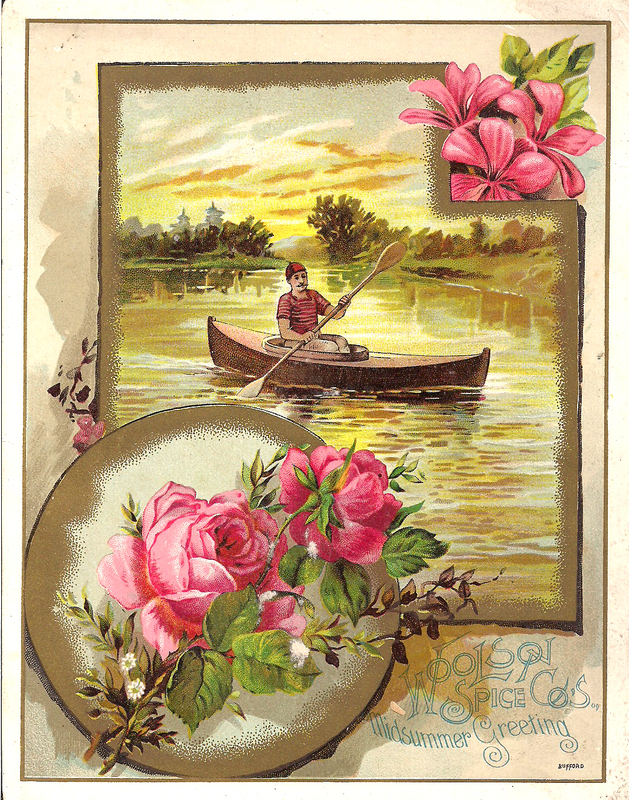 His article contains some charming engravings of mid-1880s canoes that were just on the verge of the bifurcation in design that began to occur under the pressures of racing under sail. The four illustrated here are exemplars of what Stephens considered to be wholesome types. Atlantis was owned by the noted Adirondack writer, photographer and artist Seneca Ray Stoddard. Robert Tyson’s Isabel was well known on the Toronto waterfront and at the Toronto Canoe Club, as was her skipper and his characteristic tam, with its cap ribbons hanging down behind. 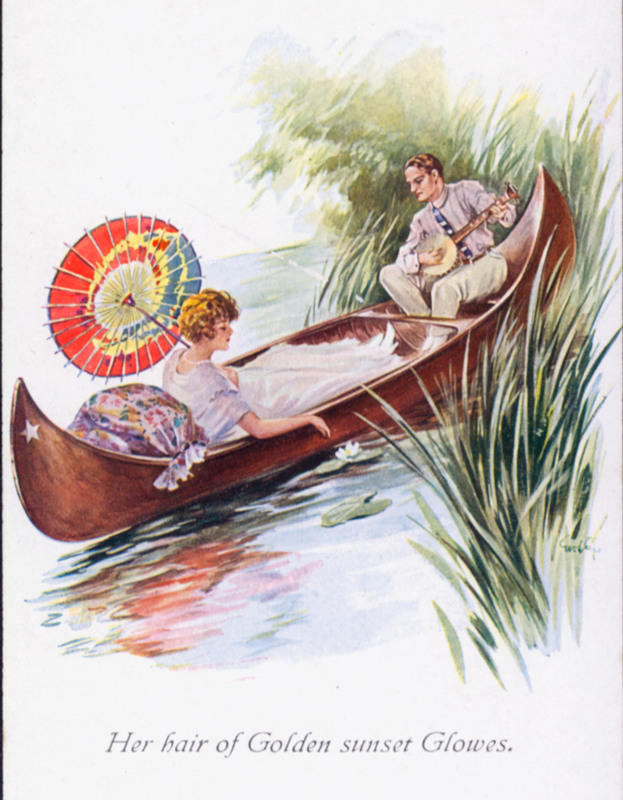 Like many canoeists of this era, Tyson tinkered incessantly with his rig, and Isabel exhibits one of his interesting innovations. The unique bent mast serves least two purposes. 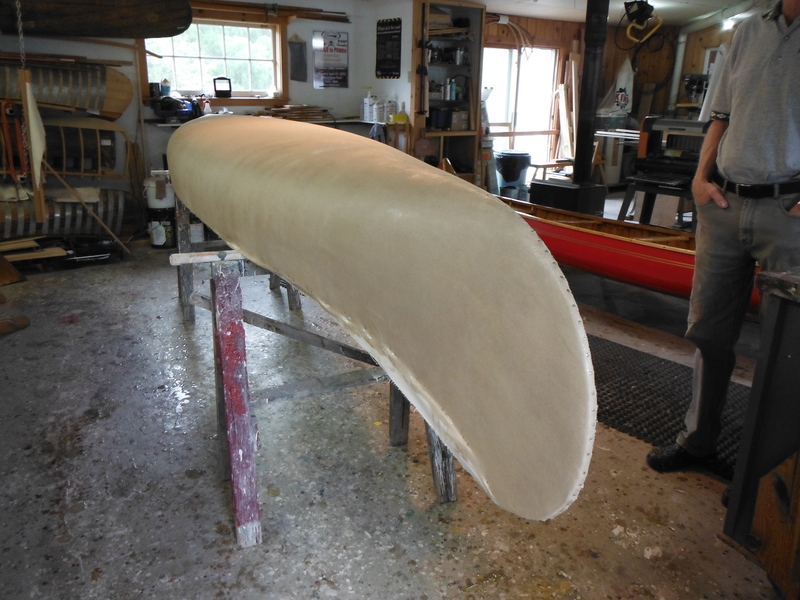 The first one is to get the rig as far forward as possible without putting the mast right up in the eyes of the canoe. Combined with the heavy roach, held out by battens, this gives a big mainsail with a low centre of effort. The spar extending below the boom also permits a vang to be used, something not normally possible because of the low boom on sailing canoes which would create too shallow an angle for a vang to be effective. 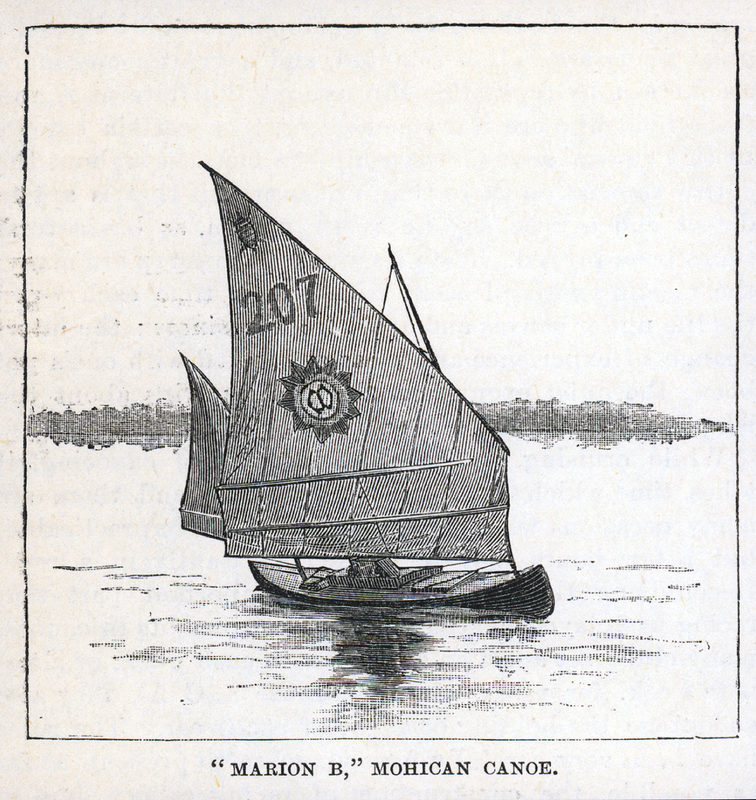 Marion B ‘s mainsail displays the turtle totem of Albany, NY’s Mohican Canoe Club, one of the powerhouses of organized canoeing in the late 19th century. 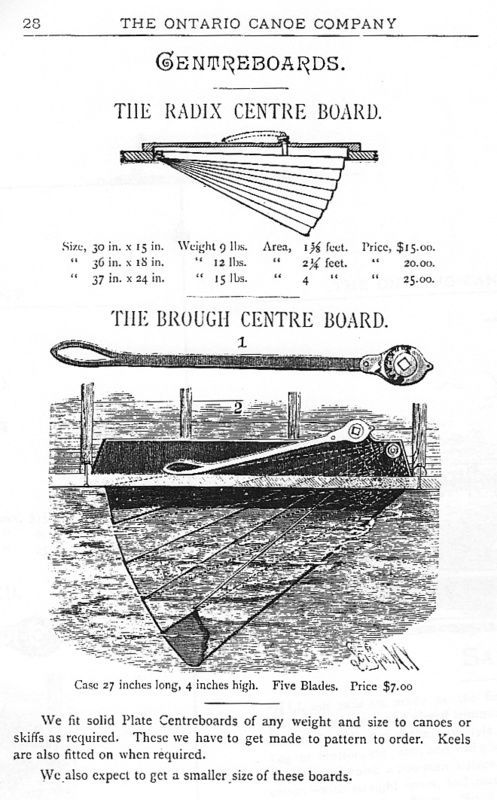 The standing lug rig with its two reefing battens is an early example of what would become known as the Mohican rig. Later versions pulled the whole sail aft of the mast and did away with the small portion extending forward, using elaborate hardware to attach the yard, battens and luff. Owned by General Oliver, Marion B was be decisively outsailed in the 1886 ACA meet by Commodore Gibson’s new Rushton-built canoe Vesper. Siren represents one of the main types of early sailing canoe, the Nautilus (the others being the Rob Roy and the Shadow) The Nautilus type originated with a number of canoes of that name sailed by Warington Baden Powell. In their first incarnations, they were solidly constructed seaboats with moveable inside ballast and heavy boilerplate centreboards, sailed semi-prone. 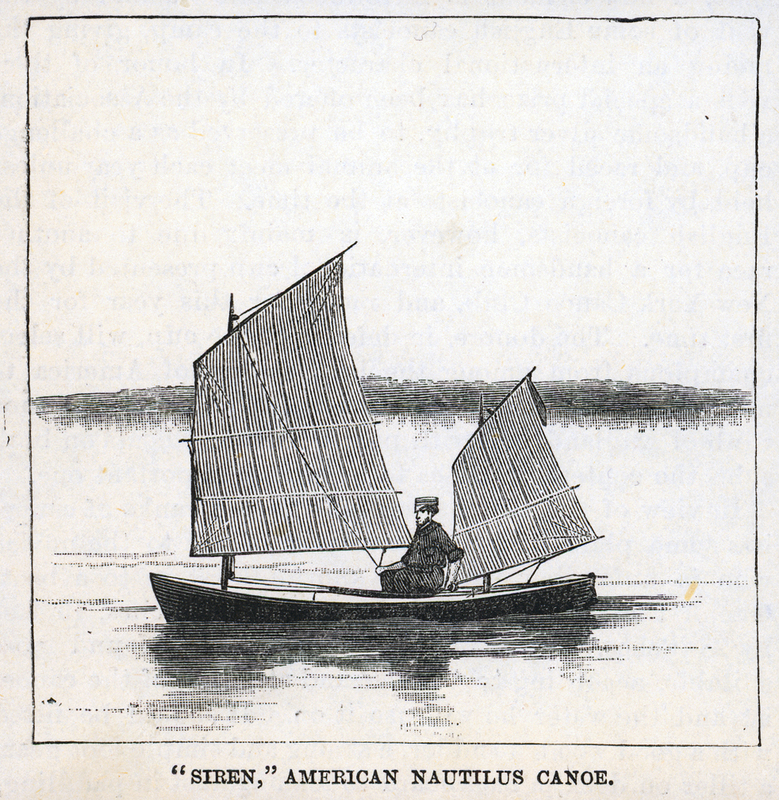 As the caption indicates, this American canoe, though ostensibly a Nautilus type, is already being sailed from the deck and not below. It was but a short step (a short slide, actually) from sitting on the weather edge of the deck to sitting outboard on a sliding seat, so notwithstanding Stephens’ misgivings about racing canoes, the wind of change was already filling these small sails. 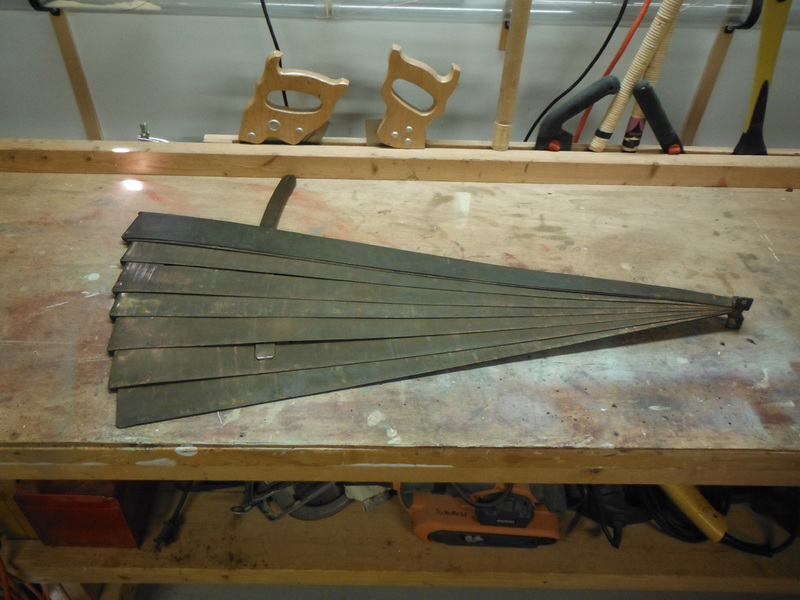 Back in the second post in this series, I was thinking about how to translate the arc bottom of the original sailing canoe into something I could build in stitch and glue. 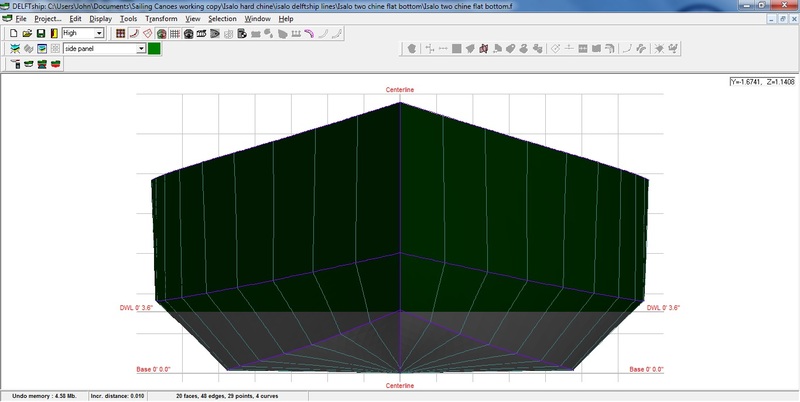 Using the original linesplan, I’ve modeled several different version of the hull in Delftship that allow me to make some numerical comparisons between them. All I’ve changed in each case is the number of chines and the underwater shape–everything else is the same (with the exception of some small changes to the bow profile to accommodate an additional chine). 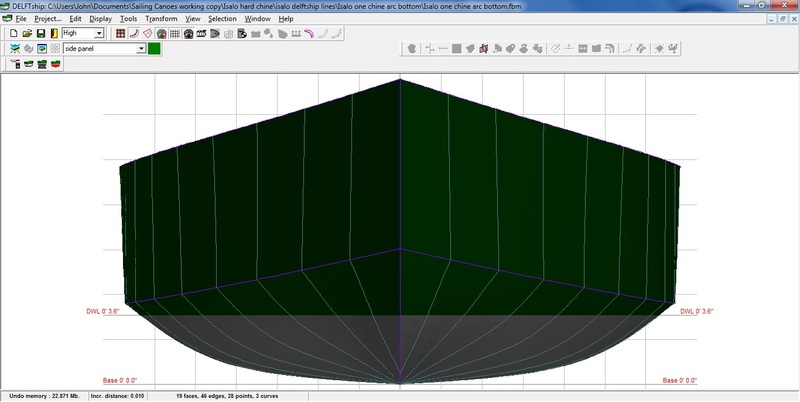 The design waterline and draft of 4″ are as on the original plans, and all these hulls are shown in a full bow-on view. Here’s the original arc-bottomed hull, which displaces .117 short tons, or 234 lbs. Here’s the same hull with all of the arc taken out of the bottom sections so that there’s just a straight section from chine to keel. This results in a significantly lower displacement of only .075 tons, or 150 lbs. How much displacement do we want or need? Well, I’d say something at least equal to the original hull. I’m also keeping in mind the displacement of my hard-chine 16-30 hull, which is .133 tons, or 266 lbs. From my experience in building and sailing those boats, they float pretty much on their marks with a sailor of average weight, so there’s a good comparison for what displacement we should shoot for in a two-masted, decked 16′ sailing canoe built in stitch and glue. I don’t think 150 lbs is going to do it. Here I’ve added another chine and pulled it down amidships to make a nearly flat bottom. I may have overdone it on the extra volume, though, because now our displacement is up to .139 tons, or 278 lbs. I’m not sure we need quite all of that. 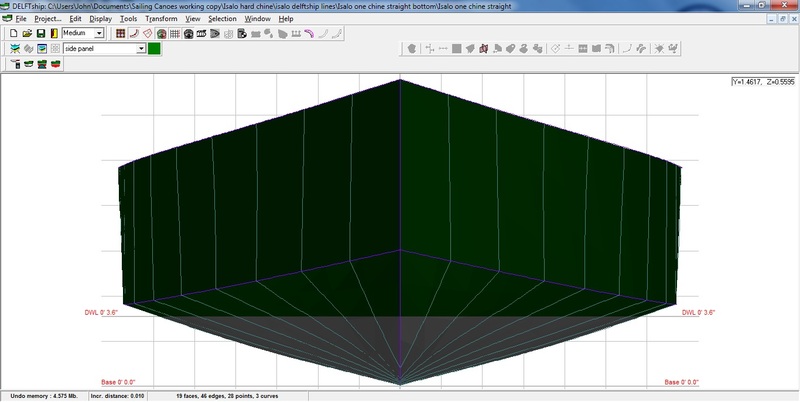 If I introduce just a little deadrise into the midships sections, leaving the ends unchanged, the displacement decreases to .128 tons, or 256 lbs, which is pretty close to our 16-30 hull. So far, so good. The next step is to add the deck and deck camber, put the bulkheads in the right places instead of just at a uniform 1′ interval and expand the individual hull panels. Then, I’ll buy some balsa wood and make a 1 1/2″ – 1′ model.